I did a ton of research about playards and what I thought would be best for us. There are so many options and different brands, it can be overwhelming. 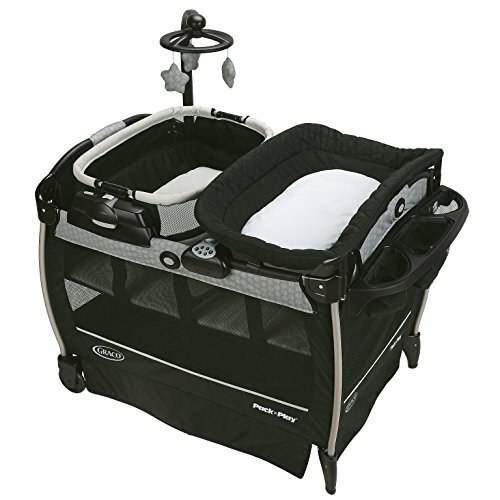 There are also pack 'n plays for every budget, depending on what you are looking for. We decided on the Graco Pack 'n Play Playard with Nearby Napper, which unfortunately was one of the pricier options. It was honestly well worth it and it ended up being one of our most valuable items. This playard has so much to offer, which I will outline below. The nearby napper is not just for sleep - it is an easy switch reversible seat, including a lay flat bassinet and an inclined napper, which can be removed or used with the playard. The seat becomes a portable rocker with 2 speed vibration that our baby absolutely loved! This is such an amazing product for us, it has served many purposes - we initially kept it in our living room and baby would nap in the nearby napper (both the bassinet and the inclined napper). Rosslyn absolutely loved the vibration and also the mobile. It was really convenient to have the changing table as well, and it's awesome that it can be used up to 30 pounds (although I don't think that is realistic). We were gifted another bassinet, which we used in our bedroom for about the first month or so. It had a small weight limit (15 pounds), so it was a great starter. Once she outgrew it, we moved the pack 'n play into our bedroom and removed the nearby napper and changing table, placing the baby in the full sized bassinet. We could've used the napper/lay flat bassinet longer, but Rosslyn really likes sleeping on her side, so at that point it's no longer recommended. We just recently transitioned into the last stage of the playard - Rosslyn weighs more than 15 pounds and one morning we woke up to find her on all fours (like in a crawl position). Since her head could kind of peek over the edge, it freaked us out and we didn't want her to pull herself up and out. As a side note, Rosslyn is growing WAY too fast and I can't handle it. There are so many great features of this playard and it has been invaluable to us. I only have a couple of small complaints about it. When we removed the napper, we also had to remove the changing table, as you can't use the full size bassinet with it attached. So, although it can be used up to 30 pounds, it just doesn't seem reasonable to reattach it each morning. Also, the mobile only works with the napper/bassinet attachment. It would be awesome if you could continue to use the mobile with the full size bassinet. This sound machine has been great, but unfortunately I felt that it was kind of useless until we moved to the full size bassinet, as it was hidden by the napper and I don't think the baby could hear it when in the attachment. Overall, this has probably been one of the top 3 most useful products we bought for baby. It is so versatile and has so many different stages, ensuring it will grow with her and be functional for years. It's also lightweight and easy to fold up and comes with a cover so it can be easily transported. This makes it a great option for those who travel. We couldn't be happier with this Graco Pack 'n Play and hope this information helps all of those who are expecting babies as well!